This post is the first part of a new series of posts dealing with the upcoming U.S. Presidential Election. Rand Paul officially announced his candidacy for the 2016 U.S. Presidential election on April 7th, 2015. Unofficially Rand Paul has been preparing to run for the Presidency ever since he first came onto the spotlight as an electable messenger of his father’s, Ron Paul’s, libertarian ideals. There has been much discussion in the libertarian movement whether Rand Paul is a ‘true’ libertarian or if he is a ‘beltarian’ more concerned with getting elected to the White House. Those who argue the latter point out that he diverges from his father on several policy issues. One issue in which both father and son remain near identical in is in immigration. Unfortunately immigration is one of the few policy areas where Ron Paul is at odds with libertarian principles. To his credit Ron Paul isn’t in favor of building a fence across the Mexican-US border, but his opposition to such a fence is that it could be used to restrict the freedom of travel of US citizens. Rand Paul in turn might be against open borders, but focuses his attacks using second-order arguments (e.g. Migrants increase the welfare state). To understand why Ron Paul, and ultimately his son Rand Paul, are not proponents of open borders we must discuss the wider libertarian movement. Libertarianism has historically been sympathetic to, if not necessarily open borders, minimal immigration restrictions. This is of no surprise given that most founders of the modern libertarian movement were migrants fleeing tyranny in Europe. Ludwig von Mises and Friedrich Hayek were both Austrian migrants. The infamous Ayn Rand, for whom Rand Paul is not named after, was a Russian migrant. Ayn Rand was also the libertarian movement’s best known illegal alien and one of its strongest proponents of open borders. It was a strange incident then when a faction of libertarian intellectuals came out in favor of migration restrictions in the late 20th century. Hans-Hermann Hoppe, a German migrant himself, convinced Murray Rothbard on the legitimacy of migration restrictions. Hoppe, who remains one of the few major libertarian intellectuals in favor of migration restrictions, argued that open borders were tantamount to forced integration. Hoppe often points out that in an anarcho-capitalist society home owners would be free to refuse to associate with whomever they please and that open borders would violate them of this right. As my co-blogger, Nathan Smith, often points out though it is possible for open borders to exist with private discrimination and thus Hoppe’s argument do not serve as a case for migration restrictions. Hans Hermann Hoppe did not manage to win the debate on migration and the libertarian movement remains largely sympathetic to open borders, but he nonetheless managed to convince some libertarians, most importantly the Lew Rockwell – Murray Rothbard circle. This circle included Ron Paul who was a friend of Murray Rothbard. Ron Paul in turn influenced his son’s political views. In short Hans Hermann Hoppe’s views on migration have culminated in Rand Paul having negative views towards open borders. One wonders how things might turned up if Walter Block, also a member of the Rothbard-Rockwell circle, had dominated discussions on immigration instead of Hans Hermann Hoppe! There are those in the libertarian movement who believe that Rand Paul is not as much of an immigration hawk as I have outlined above. To be fair, Rand is not as hostile to open borders as Hans Hermann Hoppe himself but he is no friend to open borders. During the 2013 debate on Comprehensive Immigration Reform (CIR) Rand voted against the passage of the bill. He voted against CIR arguing that it did not grant enough congressional oversight to ensure that the border was secured. The problem with this argument is that immigration creates constant political gridlock and that by increasing the role of Congress it would become increasingly unlikely that immigration liberalization would ever take place. It is difficult enough to get Congress to address immigration once every few decades; the last major overhaul was in the 80s. It is unthinkable to imagine Congress repeatedly addressing immigration as Rand desires. It is partly due to these political difficulties in immigration policy that federalizing immigration policy is an attractive option. Rand Paul, who is often seen as being more politically savy than his father, surely understands this. If so, why does he insist on a poison pill that would kill any meaningful immigration reform? As a recent interview with Rand Paul by Andy Hallman showcased, Rand is willing to make the Friedman argument that open borders are incompatible with the welfare state. However Friedman’s argument wasn’t against open borders; Friedman’s argument was that as long as we had a welfare state it would be preferable to promote illegal immigration. By no means should this post be taken to mean that Rand Paul should not be supported by libertarians in the upcoming 2016 U.S. Presidential Election. Immigration, while important, is not the sole policy issue of relevance. 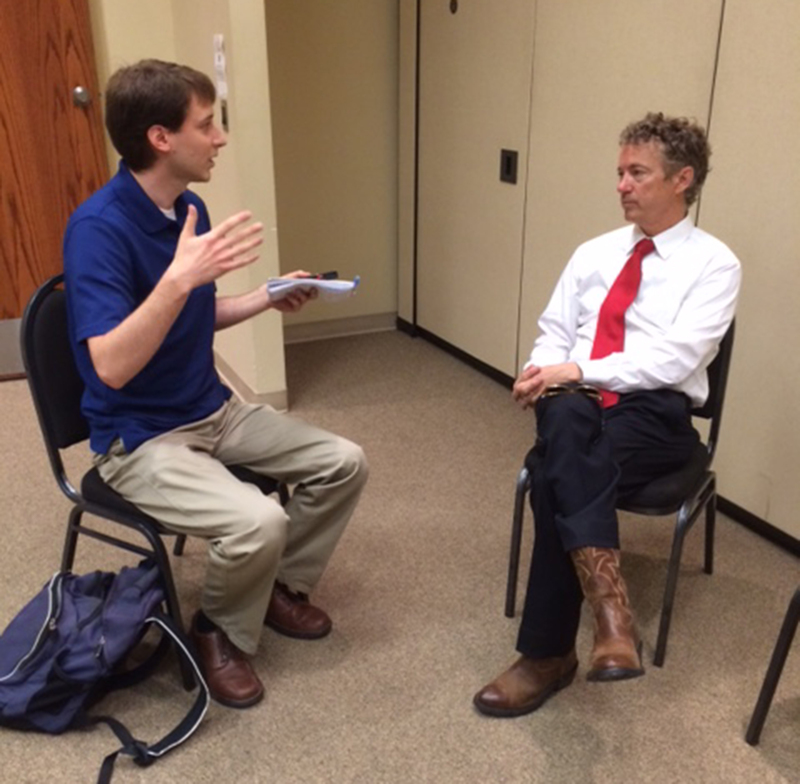 On May 16, 2015, I had the opportunity to interview presidential candidate Rand Paul, a Republican senator from Kentucky. Another reporter and I had about 12 minutes to ask him questions before he gave a speech in Central Park in Fairfield, Iowa. The short version of our exchange is this: I asked Paul how, since coercion is normally wrong, immigration restrictions are justified. He responded by saying they were necessary to keep the welfare state from exploding in size. I asked him why the government could not exempt immigrants from welfare if that was the case. He seemed open to the idea of unlimited immigration provided the immigrants came to work and not go on welfare, and suggested cutting welfare and opening the borders in the same stroke is not so easy. What you see below is a partial transcript of our interview. I have included just the portion that relates to immigration. The full transcript can be found on my blog here. Andy Hallman: [Let me] move on to another issue, but it’s along that same line about your general philosophy of government, and that is immigration restrictions. Immigration is in the news a lot. Immigration restrictions seem like an act of coercion, an act of aggression, preventing someone from moving where they want to, taking a job where they want to. So it seems like, on the surface, that is wrong. Why do you think immigration restrictions are justified? Rand Paul: Milton Friedman also had something good to say on this. He said basically you can’t have open borders and a welfare state. So the problem is … we’ve agreed to have some coercion and compulsion in our government. In our system, it’s much greater than I would have, so half of my income is taken from me and given to government. If we say we’re going to have an open border in that system, then it would be 75 percent or maybe 100 percent of my income that goes to other people through a form of compulsion. There was a PEW study that added up data from a lot of different countries, and asked them, if you could, would you go to the United States? 600 million would come. We’re a country of 300 million, it would be a bit disruptive to have 600 million people show up, so it has to be an orderly process, and there is now a great religious sort of struggle and war going on [and people] who for many different reasons, don’t like Americans and would come and kill us, so you have to know they’re coming across the border to try to stop them. Hallman: Although, screening those out wouldn’t justify the kind of quotas that the government has instituted. To talk about what you just said about welfare, it’s true that welfare is an act of coercion, but I would think immigration controls may be a more grievous kind of coercion. You’re preventing someone from improving their life, perhaps by an order of magnitude in their earnings, if we talk about someone in Haiti or India. Paul: If it were only border controls that had to do with people coming to work, I’m for as many people coming to work who want to. I’m for an expansive work visa program where we don’t mind people coming to work. The problem is, as Milton Friedman described it, is that we have an enormous welfare apparatus. Not everybody comes to work. Some people come to receive. If 60 million people come here [perhaps he meant 600 million, the figure he stated earlier], it would overwhelm us. Hallman: It sounds like the solution and the just thing to do is to eliminate the welfare state and to eliminate the quota system. Would you be in favor of that, those two measures side-by-side? Paul: We rarely get decisions like that. We get decisions on, “Do you want to improve the immigration system?” I think the immigration system is broken for a lot of reasons. We have 11 million people here who came in here and explicitly broke our laws to get here. So we do have to figure out something to do or 11 million more will come, so that means the immigration system writ large needs to be reformed and fixed. Milton Friedman: Look, for example, at the obvious, immediate, practical example of illegal Mexican immigration. Now, that Mexican immigration, over the border, is a good thing. It’s a good thing for the illegal immigrants. It’s a good thing for the United States. It’s a good thing for the citizens of the country. But, it’s only good so long as it’s illegal. Friedman’s views aside, those who make the welfare objection to free legal immigration must answer two questions: 1) Given there is some tension between the size of the welfare state and free immigration, which is worse? Welfare or immigration restrictions? and 2) Is there some way to mitigate the effects of immigration on the welfare state that do not involve outright prohibition of immigration? To question #1, it does not at all seem obvious to me that the tension between welfare and immigration implies immigration restrictions any more than it implies living with both open borders and a larger welfare state. As I point out to Paul, welfare is coercive just as immigration restrictions are coercive, so we must weigh the wrongness of each act of coercion. When we compare the scope of coercion from the two acts, the contest is not close. The welfare state prevents some people from buying things they could have bought if not for the taxes they had to pay, and that is wrong. Bryan Caplan and Scott Beaulier make a persuasive argument the welfare state even hurts recipients by amplifying the negative effects of their self-control problems. But there are many things the welfare state does not do. It does not dictate where people can and can’t live, where they can work and for how long, and it does not tell people whom they can marry. Immigration restrictions do all of that. While the welfare state’s track record on helping the poor is a matter of debate, there can be little doubt that immigration restrictions condemn millions of people to a life of poverty. To take one of the most extreme examples, the average Haitian experiences a seven-fold increase in wages upon immigrating to the United States. By denying Haitians and others the right to immigrate, we aren’t just refusing to help them out of the poverty trap, we’re kicking away the ladder. My contention that some immigrants could see their earnings rise by “an order of magnitude” is an exaggeration for the average immigrant now under mostly closed borders but is not much of an exaggeration for the most destitute immigrants from the Third World. I do not know where Paul got the idea his taxes would rise to 75 or 100 percent under open borders, but that is an unlikely scenario given what we know about the public’s willingness to fund welfare programs. If 600 million people immigrated to the United States, we would more likely see a drastic reduction of benefits than we would see a drastic increase in taxes because taxpayers do not like paying for people who are not like them. I was glad to hear Paul say he was in favor of unlimited immigration for people who want to work. Since he is clearly worried about the size of the welfare state, I was disappointed he had not thought of keyhole solutions to allow free migration while cutting immigrants off welfare. We know this is politically feasible because the federal government has already done it. It did it two decades ago with the welfare reform act of 1996, which prevented legal immigrants from accessing many government benefits. The welfare objection to immigration is the easiest for open borders enthusiasts to accommodate since we know it can be done, so while I was disappointed in Paul’s treatment of the issue, I sensed that he could be converted to the open borders position with a little persuasion and perhaps a keyhole solution or two. The links below were added by the Open Borders: The Case editorial staff and not picked by the author. Rand Paul, Hans Hermann Hoppe, and Immigration Policy by Michelangelo Landgrave, Open Borders: The Case, June 5, 2015 (note: this link has been added retrospectively, as Landgrave’s post was published after the publication date of the post you’re reading). Rand Paul’s interesting precedent by Nathan Smith, Open Borders: The Case, March 12, 2013. Support for open borders is a fundamental tenet of libertarianism, and David Brat is not a libertarian by John Lee, Open Borders: The Case, June 18, 2014. Citizenism and open borders by Michael Huemer, Open Borders: The Case, February 18, 2013. Immigration and the US Constitution by Ilya Somin, Open Borders: The Case, March 18, 2013. Four Things We Know About Rand Paul’s Immigration Policy Views by Eric Gibble of the Immigration Policy Center, April 9, 2015. While I don’t generally buy into the views of Ron or Rand Paul on foreign policy, Rand Paul’s filibuster, which is being credited with giving new momentum to the GOP, sets a promising precedent. Paul’s insistence that the president has no constitutional authority to use drone strikes against Americans on US soil was morally obvious, yet at the same time profoundly subversive, since it implies that there are, after all, limits on state authority, and therefore that the doctrine of sovereignty in the pure Hobbesian sense is fall. Bravo! 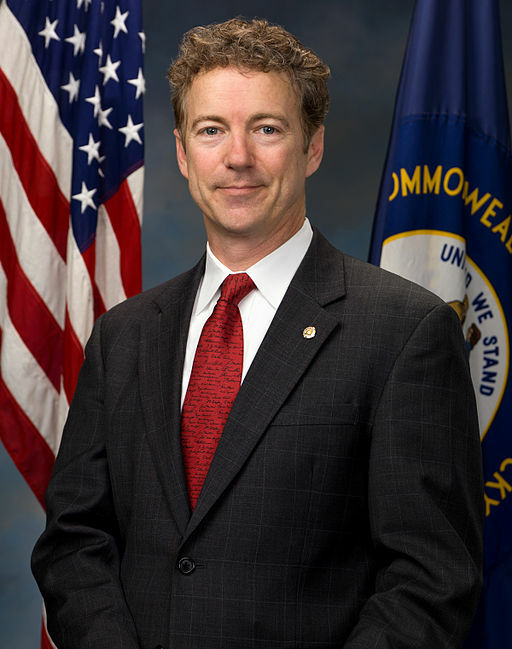 Interestingly, since the Republicans have a reputation as the hawkish party, strong on national security, Paul’s stand actually went against part of what Republicans identify with, but the political configuration allowed Paul to appear, sort of, as the voice of the GOP against the soulless statism of the Obama administration. Paul’s message was fundamentally the doctrine of human rights or natural rights: it’s wrong to kill innocent people, period. It probably wouldn’t work right now, but one wonders whether at some point in the future, Republicans could be flip-flopped on the immigration issue with similar ease. If a Republican candidate opportunistically assailed the Obama administration for its draconian deportation policies, that would doubtless alienate some of the base, but the GOP might look like white knights and protectors of the weak, and become more popular in some quarters, and Republicans who aren’t particularly nativist might just embrace it. What’s at stake here is the moral high ground. Seizing it is really a lot of fun, and it can pay off in the oddest and most delightful ways. Rand Paul’s interesting precedent is licensed by Nathan Smith under a Creative Commons Attribution 3.0 Unported License.